Standing on the side of a street under the porticos in Bologna is a man selling little packages of tissues. He is in the same location every day except for Sundays. He is cheerful and engaging, regularly speaking with people as they pass him by. Professor Pagano had called my attention to this friendly man and recommended that I speak with him to learn about his migration story. Professor Pagano and I walked over to meet him. After shaking hands and making our introductions, I learned that he is called Efosa. We had a short conversation, in which we shared information about where each of us were from and made plans to meet on Piazza Maggiore the next day to continue our conversations. When I went to buy tissues from him, he refused payment and instead, unexpectedly, offered me a packet for free. I was caught off guard as I had been accustomed to people asking for money throughout the city. It was a gift. The next day, I was looking forward to meeting Efosa who had intrigued me with his magnanimous gesture. At the appointed time, he was standing in Piazza Maggiore with his bike, ready to tell me where he had come from and the journey he had experienced prior to arriving in Bologna. I wanted to take him to a cafe but he refused and preferred that we sit on the steps of the San Petronio Basilica. Again I found his lack of want surprising. Later, I found out that his name in his native tongue means “God’s wealth,” it would seem that his name is a reflection of his character, generous even though he has very few material possessions. He is Nigerian and speaks English and Italian in addition to his native language. In his country, he had trained to become a technician and had worked there. He left Nigeria in 2009 in search of better conditions and to help his family. He has a wife and three children. It was a hard decision but one he felt he had to make as there was no work; the economy was poor and there was government corruption. We used my phone to look at YouTube videos of Nigeria’s political and environmental climate, and he explained to me the conditions there and even discussed the natural hazards. When he left Nigeria, it was a harsh journey. He first went to Niger and then to Libya where he found work and for a while he was making sufficient money, enough to send some home to his family. He was in Tripoli, Libya during the rule of Muammar Gaddafi, and when violence broke out, he and many others escaped by boat to Italy as it was their only safe option. There was no food for many days during the treacherous crossing. They were rescued by the Italian police who brought them ashore and fed them. He then began a series of jobs working in Taranto and Napoli. After a while, work ran out in Napoli and he had a friend who invited him to come to Bologna to try and find a better life here. The Catholic Church here in Bologna has helped him and feeds people for free. He is grateful for the support the Italian people have extended him. He did express his concerns and his hopes for continued and better employment so that he could support himself as well as see his family again. We talked about music – a universal subject, and the types of music he liked. He asked me about life in America and if it is better than in Italy. I could honestly say, the food in Italy was magnificent and we both had a good laugh about that. Efosa is there every day – doing what he can to get by. To me, he is no longer a nameless stranger, he is someone whom I have come to know if only a little, during my stay here. Like so many immigrants, he is looking for a better life for himself and his family. He works hard and maintains an attitude of resiliency that, considering all that he has been through, is inspiring. He, like millions of others who have reached Italy’s shores, like my Grandfather before him, is the recipient of Italy’s ancient and deeply rooted generous nature. If I have learned anything here during study abroad, it is that while the migration problems that challenge Italy remain, there are many hands at work trying to help resolve them – from the government, to educational institutions, to churches to individuals. Italy is rich in so many ways – history, art, (the food!) but mostly in heart. Professor Pagano, Director of the K. Robert Nilsson Center for European Studies in Bologna, had kindly arranged for me to meet with Giulio Asta, an Italian teacher for the Mondo Donna Scuola di Italiano per stranieri, “emergenza sbarchi” (A school for teaching migrants living in Bologna and a part of the Emergency Landing Team). I arrived at L’Ortica, a restaurant/bar where we were to meet to discuss my migration research/blog project. I was ready for my meeting, I went early and was armed with my pre-approved research questions. After exchanging our greetings, I set about laying out my agenda with Giulio and explained how I envisioned the research being conducted. Did you know what to expect when arriving in Italy? How has your experience been to date? Do you think education in cultural differences and similarities would help ease tensions? Do you have any ideas of how your experience could be better? What I suppose was my idea of a rudimentary field report – defined here as describing the observation of people, places, and/or events and to analyze that observation data in order to identify and categorize common themes in relation to the research problem underpinning the study – wasn’t going to be feasible according to Guilio. He explained that surveying, questioning, and videotaping his students was, culturally speaking, too aggressive and that it was highly unlikely that they would open up to a stranger that readily. He let me know that if I changed my approach from a research-based questionnaire to meeting migrants on a social level, I would be able to better understand their struggles and situation. So, what started out as a straightforward Q&A and a video field report has now transitioned into what I am coining a “feel report” — a much more realistic and culturally-sensitive, immersive interchange. The conclusion from this eye-opening meeting was that I, and perhaps many of us in America, are perhaps conditioned to think in specific results-oriented ways. We want to quickly dive into matters, and try and scientifically calculate or tabulate information. We draw our conclusions on things we have read in the media or hear via political “sound bites,” and rarely have boots on the ground when we analyze or take a stance on an issue. In the half hour conversation I had with Giulio, I can say I personally learned more about migrants than the collective number of articles I have read on migration. Ultimately, we are talking about compassion and understanding. I am eager to get to know a migrant on a personal level and to hear his or her story. It is by connecting with one person at a time that we can come to better understand human conditions and problems. Having a frank and deep conversation with one person will provide me with deeper insight into migrant views, life and their situation than any stats I could compile. I look forward to sharing with you my feel report. The Oxford Dictionary defines migration as the movement of people to a new area or country in order to find work or better living conditions. Migration can be voluntary or involuntary, and it can be because of war, or for political, cultural, environmental and economic reasons. Human history is overwhelmingly a story of migration. From prehistoric times and right up to today, Italy has been a destination for migrants. Due to its geography and place in the Mediterranean, Italy serves as a land bridge to and from Europe attracting invaders and migrants alike. From 5,300 years ago when Ötzi, the now famous Copper Age glacial mummy crossed Tisenjoch/Giogo di Tisa in the Schnalstal/Val Senales Valley, into South Tyrol, to a historical parade of Indo-Europeans, Etruscans, Greeks, Romans, German tribes, Visigoths, my ancestors – Attila and the Huns, Vandals, Ostrogoths, Lombards, Hungarians, Arabs and the French alike – all migrated to Italy. Migrants throughout the ages have brought with them their culture and customs. These unique attributes have enhanced, enriched and strained relations with local communities. From a positive and cultural perspective, if we look back over history, we can say that migrants such as the early Greek colonies have been proprietors of Italian culture, helping influence Italian art and architecture with their classical styles. History records another example, the migration of Syrian artisans and craftsmen who helped develop Venetian glass techniques. There are countless records of how various peoples over the ages have helped enrich, advance, and shape the very fabric of Italy. There are also countless historical examples of how migrants have clashed throughout the ages. 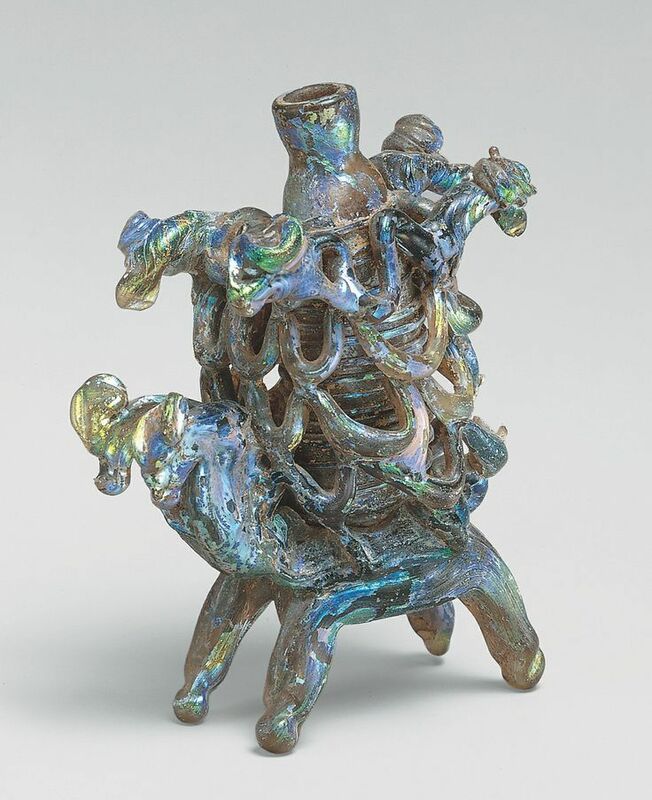 An example of a Syrian glass cosmetic bottle in the form of a dromedary with a pack on its back. 8th-9th century. Today, Italy continues to attract migrants from North Africa, the Middle East, and from Western European nations that are suffering economically and as in the past they are leaving their mark on Italy as they integrate into major cities, with their own food, music, religion and artwork. According to The Economist, this year alone, Italy has absorbed an overwhelmingly large number of migrants arriving in Italy by sea, over 17% more than in 2016, totaling 93,335. Unlike in 2015, when Syrians fled from war and persecution, these migrants are arriving on Italy’s shores for economic reasons. They come primarily from Bangladesh and Nigeria and are undocumented, presenting Italy with a tremendous humanitarian burden. Carlotta Sami of UNHCR, the UN’s refugee agency, who is quoted in The Economist article estimates that more than 170,000 migrants are in Italian reception centers or are being housed by local authorities. Even from this year’s April map of migrant flows to Europe below – we can see that Italy is overwhelmed in comparison to the rest of Europe. To say that these are incredibly difficult times for migrants and local Italians is an understatement. While Italy needs migrants to bolster its declining birthrate, this country with a big heart needs help from the EU to help migrants and locals alike find a hopeful solution. In my next blog, I’ll look at what some migrants are doing and ideas that Italians have put in place to aid with cultural integration. 70 years ago, the young man in the photo, my grandfather, left Communist Hungary on a student visa to study abroad. When his official papers didn’t arrive in time for him to extend his stay in the country he was studying in and he was to be deported, it was a kind-hearted and generous Italian student and his family that took him home, and shared the little they had with him. My grandfather’s immigrant adventure — the adventure of his lifetime — began with the kindness of a stranger. 70 years later, his grandson returns to Italy to study and to learn about immigration. In this blog, I’ll examine current day feelings of locals and refugees, and the subject of immigration, which is even more pressing today.